I developed this recipe for a “Trends” article. Both panna cotta and tropical fruits were finding their way around restaurant menus at the time, so blending them together made perfect sense. The panna cotta itself has a very slight tang from the buttermilk, which makes it very refreshing, and the illusion of being not so rich (lets not kid anybody here). Feel free to experiment with your own accompaniments; it is even lovely all on its own. It is gently held together by the gelatin and its milky, quivering sweetness can certainly be appreciated as a stand-alone treat. Take a bite of it without the fruit so that you can experience it solo – it will give you ideas about how you might like t top it another time. Note that while the panna cotta could last days in the refrigerator, it will take on a less delicate and more rubbery quality as time goes on. This happens with all gelatine-based desserts. An extra 24 hours won’t change it that much, but another day after that and you will begin to see it degrade in textural quality by becoming overly firm. Place water into small bowl; sprinkle gelatin over. Let stand until gelatin softens, about 5 minutes. (it should look spongy). Combine cream and sugar in heavy medium saucepan. Stir over medium heat until sugar dissolves and mixture is hot but not boiling. Remove from heat; add gelatin mixture and whisk gently until gelatin is completely dissolved and mixture is combined and smooth. Cool to room temperature. Stir buttermik and vanilla into cream mixture. Pour mixture through fine strainer into 4-cup measuring cup or pitcher. Divide mixture among six, 3/4-cup custard cups or ramekins. Refrigerate until panna cotta is set, at least 6 hours or overnight. (This overnight in the refrigerator makes this a great do-ahead party dessert). Run thin sharp knife around sides of each panna cotta to loosen. One at a time, place bottom of each custard cup in 1 inch of hot water for about 30 seconds; immediately invert custard cup onto plate. Using both hands, firmly grasp custard cup and plate together, shaking gently in a side to side motion, encouraging the panna cotta to release. 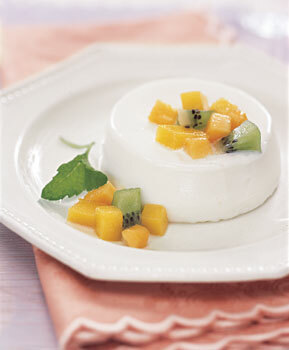 Remove ramekin; spoon fruit mixture around each panna cotta and serve.